Yesterday was a sober reminder of the struggles that many networks face in the fight for an adequate minimum income, particularly in countries where civil dialogue and defense of human rights are a continual challenge. We were warmly welcomed by the Serbian network and spent the afternoon in the heart of Belgrade’s beautiful and busy central shopping area. 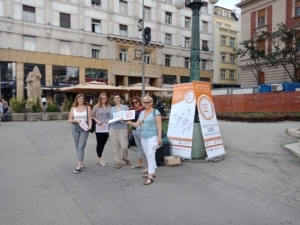 As It is prohibited by the Law for buses to be parked on public squares, we had to battle the wind with our banners, balloons, leaflets and badges. Then we tried to engage local people in a discussion on the right to minimum income, encouraging them to sign the petition. Over a quarter of Serbians live at risk of poverty. Serbia has a piecemeal and minimal safety net which amounts to less than 70 Euros a month, but still many people are resistant to supporting higher levels of minimal income. Life is so tough for the majority of people who are in low-paid and precarious jobs, that minimum income is seldom seen as a priority. Although most people recognize it as a basic right, which supports people into decent work. 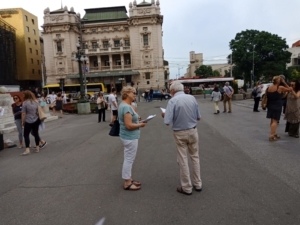 As the Serbian network explained, people in Belgrade are also very wary and burnt out with political campaigning which they believe has not tangibly increased participation nor led to real improvements in their living standards. This we could palpably see, as most people on the streets avoided the stand and our advances. Still, with perseverance we managed to engage some, such as one older women, living on a minimal pension who is working as a volunteer in the local theatre. ‘The money and wealth in all the wrong hands’ she said, ‘people should have enough to live’. Despite her views and support, she wouldn’t sign the petition. The main enthusiasm for signing came from EU visitors or workers from the Netherlands and the UK, including an English investment banker who promptly signed, although when questioned admitted that he was there looking for good returns on profit which business in Serbia offered in abundance – because of social dumping and low wages as Jasmina from EAPN Serbia quietly challenged him. We also got a visit from a couple of local policemen, checking our papers were in order. But of course, it had all been perfectly organized by EMIN Serbia! However, we didn’t summon up the courage to ask for their signature! « Day 42, BUS 1. Bucharest: good bye EMIN BUS, welcome adequate minimum income!